GM tries to use robots to convey a sense of quality in an attempt to take on Toyota’s reputation. However anyone that knows anything about the Toyota Production System, aka lean manufacturing, knows that a core component is people. People create the suggestions for improvement that lead to improved quality. Robots can’t do that. In a similar vein, GM fires the robot after a single miniscule mistake. However lean teaches us that the process is most likely the problem, not people. In a Toyota plant, the robot that dropped the screw would be immediately surrounded by a team trying to figure out how the process failed and how it could be improved. Not a team looking down on the robot. People have the knowledge and experience that can be leveraged. You don’t just fire them. The spot is supposed to tout GM’s new 100,000 mile warranty (something that what, Kia, pushed five years ago?). 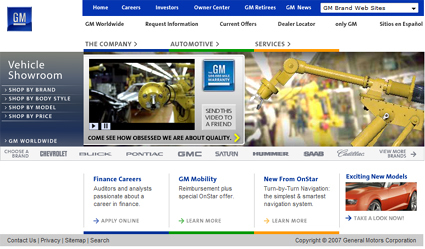 But what it–and virtually every ad for every GM product–does is underscore what a crap factory GM is. The robot ad is below (and I look forward to an anti-immigrant version in which the American robot loses a job to a Mexican robot who will work longer hours for less pay), so check it out. Now, imagine the entire lot of auto industry workers, 25,000 of whom will soon be in the same spot as this robot via GM itself, watching this commercial. Countless more in Michigan and other locales have already lost their job to such robots, and I am sure schadenfreude is the last thing on their minds. No, they saw their lives mimicked and mocked in this robot’s quest for work reflect their own journey to a land of severely less paying service industry job. They will connect with the hopelessness captured by the robot, a hopelessness that is post-manufacturing in America’s heartland. And they might even throw a can of beer at the TV in disgust over how disconnected the fat cat board members of GM who approved this ad have become. GM watches as robot commits suicide, does nothing. Just a horrible, mean-spirited ad. GM proves it remains an uncaring 20th century behemoth. Stressing out even its machines so much they’re considering suicide. GM demonstrates its ruthlessness and unwillingness to invest in its people. The only resonance this will have in the heartland of America is how little GM understands the people that live there. A purely brutal corporate message. So we have one of the largest centrist/conservative blogs, one of the largest leftie blogs, one of the largest tech blogs, and one of the largest advertising industry blogs… all saying the GM robot commercial was offensive and off-base. So what do those GM execs do? Unbelievable. Nothing like doing your best to promote the fact that you’re ignorant of what real manufacturing excellence, and quality, is really about. People, knowledge, and process. Not robots, static algorithms, and the assumption that the worker causes mistakes. Someone is finally sticking up for the robots! how many laid-off gm employees have committed suicide?